Along with the leaves changing and the temperatures getting a little cooler, the return of football is a welcome aspect of autumn. And no matter who your favorite college or pro team is, the Grand Strand is rife with amazing sports bars that will fill your appetite for both food and sports action! From North Myrtle Beach all the way to Murrells Inlet, here are a few great places to catch limitless football each Saturday and Sunday this fall. Located in the popular Barefoot Landing entertainment district, Wild Wing Cafe has been a favorite destination for sports fans looking to watch the big game while on their North Myrtle Beach vacation. Wild Wing Cafe features plenty of seating at the bar, around high-tops or in booths or tables and all the seating areas have clear viewing angles to dozens of flat-screen HDTVs mounted around the restaurant. Wild Wing also features a large outdoor deck with beautiful views overlooking a saltwater marsh. The extensive menu of Wild Wing showcases their amazing, fried-to-perfection buffalo wings available in over two dozen sauces, but also features tantalizing options like huge burgers, quesadillas, fresh salads and more. Be sure to order up some game-time apps like their signature Steel Town Spuds or spicy buffalo chicken dip to please your crowd. For those seeking sports action while in Myrtle Beach, there’s no place like Broadway Louie’s at Broadway at the Beach! Famous for being the premier karaoke spot in Myrtle Beach, Broadway Louie’s is also the perfect spot to catch all the games on Saturday and Sunday afternoon. Everywhere you look you’ll find hard-hitting action up on dozens of mounted HDTVs as well as several huge projection screens. If your stomach starts growling, Broadway Louie’s serves up great gameday food options like buffalo wings, flatbread pizzas, nachos and oven baked subs. And with an extensive selection of draft and bottle beer and signature cocktails like their Touchdown Dance Pigskin Punch, you can celebrate your team’s big win over ice cold tasty beverages. Seeking the perfect place to catch the games while on the southern end of the Grand Strand? Carolina Tavern is just the place to watch the game, grab a drink and chow down on amazing fresh food. 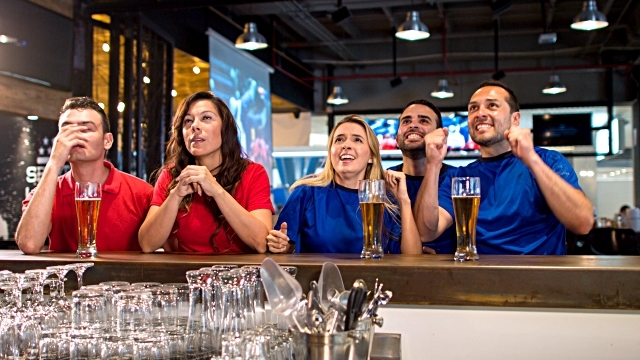 Grab a seat at the bar to scope out the excitement on one of several mounted HDTVs or snag a booth for your group, many featuring their own personal TVs so you can choose what game you watch. An extensive draft beer selection and full bar ensures your thirst will be quenched and you have to try something off Carolina Tavern’s amazing menu. Gameday specials include deals on boneless wings, crab bites and pulled pork BBQ sliders. If your appetite is especially fierce, be sure to check out their fall-off-the-bone ribs or unique options like their deep-fried turkey platter or beer can chicken. As you can see, whether you’re in Myrtle Beach, North Myrtle Beach or Pawleys Island, it will be easy to catch all the football action this fall while on your Grand Strand vacation! And with the amazing fall deals from Beach Vacations, you can book your upcoming Myrtle Beach vacation at an amazing low price! From our Myrtle Beach condos at Myrtlewood Villas or Atlantica Resort or North Myrtle Beach villas at Barefoot Resort, we have the perfect spot for your fall trip to the Grand Strand.